Evansville, IN - The Evansville IceMen, proud members of the ECHL and affiliate to the NHL's Ottawa Senators and AHL's Binghamton Senators, officially announced the team's promotional calendar for the 2015-16 season today. The organization's fourth ECHL season and eighth in professional hockey in Evansville begins Saturday, October 17, 2015 with the Season Opener and concludes Saturday, April 2, 2016 with Fan Appreciation Night. 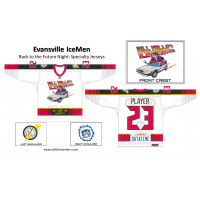 For the first (and only) time, fans can channel their inner Marty McFly for a special Back to the Future Night on Saturday, October 24, 2015, when the IceMen celebrate the date Michael J. Fox's character traveled into the future in the second installment of the Hollywood trilogy. This is the first-look at the specialty jerseys IceMen players will wear on that night. The IceMen's 5th Annual Education Day will be November 4, 2015, when Evansville hosts the Indy Fuel for a 9:30am Wednesday game. Other annual events throughout the season include the vastly popular Star Wars Night on Saturday, January 16, 2016 and Pink the Rink Weekend February 26-27, 2016, in support of Breast Cancer Awareness. The team will wear specialty jerseys for both of those events, as well as for Prostate Cancer Awareness Night on Saturday, November 21, 2015. The Evansville IceMen invite all members of the media out for a special Media Day at The Ford Center on October 14th. Guests are welcome to arrive at any time during the team's practice which is scheduled for 10am-12pm that day. Following the practice, appetizers will be served around 12:30 pm and the players and coaches will be introduced and made available for interviews. Evansville opens the 2015-16 season Saturday, October 17 at The Ford Center against the Indy Fuel at 7:15pm. 2015-16 IceMen season tickets are on sale now. Call an IceMen Account Executive at (812) 421-GOAL (4625), Monday through Friday from 9am to 5pm for tickets. Season tickets start for as little as $10 per game. For more information about the IceMen, please visit www.evansvilleicemen.com.